Foundations and Best Practices in Early Childhood Education, 3/e presents a broad exploration of the scope, roles, and practices of working with and for children and families that's ideal for both the beginning educator, as well as for those with experience teaching young children who are working to further their education. Toward the goal of helping educators make connections between beliefs and philosophies and practice, it includes stories or extended vignettes from a variety of classrooms that highlight how teachers and programs are integrating guiding principles and beliefs into applied practice. A resource for those beginning or continuing a reflective journey on the evolving path of defining and reshaping an educator's own practice with children and families, it encourages educators to go forth and find a voice that will be used to advocate on behalf of all children and families. 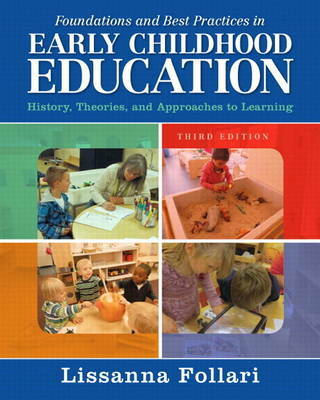 Now also available as a Pearson Enhanced eText, this new edition reflects recent changes in early care and education practice based on legislative and policy changes, as well as the latest research on effective practice. Included are contextualized videos, Learning Outcomes, streamlined summaries, additional charts and graphic features, coverage of evidence-based practice and Common Core State Standards, and some important content changes that bring the material up-to-date and in step with today's latest information in the field. The Enhanced Pearson eText features embedded video and internet resources. The Pearson eText App is available on Google Play and in the App Store. It requires Android OS 3.1-4, a 7" or 10" tablet, or iPad iOS 5.0 or later.